There has been a great deal of publicity lately about the Internet of Things (IoT) and numerous applications have already been officially demonstrated. With many large numbers of potential applications, IoT has demonstrated how effective they are, in altogether expanding the usefulness of business, the board applications of the ERP software and how organizations work together all in all. It is a well-known fact that ERP is considered as the core matter of any organization. Why because it offers a solitary wellspring of information. Integrating ERP with IoT can extraordinarily increment the information accessibility and precision in any business industry. This can create huge ramifications over enhancing the extensiveness of your ERP software in different zones such as customer service, inventory management, forecasting or business intelligence. If we take the current scenario, it is quite evident that IoT has already made a sub stantial impact in the manufacturing sector. For instance, sensors attached to equipment empowered the manufacturing industry with a greater level of maintenance automation and ensured that vital data is made accessible to those who rely on it, from shop floor technicians to decision makers in the management bench. Most importantly, integrating ERP with IoT enhanced the business communication of the manufacturing industry. The integration brought in the customer and supplier in close proximity reducing errors and wastages in supplies. With ERP –IoT integration, business organizations would now be able to screen their machine activities from anyplace on the planet and perform the real-time investigation of streaming data. IoT also empowered social analytics and brought alive a more straightforward interface with clients. Thus the instant accessibility of exact business knowledge enabled the business management in settle scores easily and deriving more strategic choices. Furthermore, the usage of IoT sensors and gadgets, re-orders, renewal, and Kanbans eliminated the interplay of humans in communicating within the ERP. With immense measures of information able to be captured, the utilization of machine learning applications enabled the ERP framework to produce intelligent suggestions for the managers associated with varied business functions like supply chain, factory floor, customer management or more. In short, IoT arrangements are giving new chances for the ERP to broaden and thereby expand the business. New sources of information and expanded volumes from existing sources can possibly convey more noteworthy bits of knowledge to managers at each level of association. How ERP integration with IoT fuels the business revenue? For instance, take the case of the manufacturing industry. Growth, qualitative deliverables, enhanced production, supply chain efficiencies are the most astounding priorities of manufacturers today. In this case, there is no doubt that IoT innovations can act as a catalyst in fueling the growth of manufacturing industries. Imagine yourself at a reputable position in a manufacturing unit. Think of having an insight to new bits of knowledge on each manufacturing progressions in real-time- be it the supply chain, administration, production or fulfillment. Envision how each contributes, brings down absolute item quality and succeed in conveying an astounding client experience. Think on how the day by day status of production plants' machinery directly affects the product quality. These are challenging questions to be answered by the manufacturing unit. A manufacturing ERP has already streamlined these challenges to a great extent. 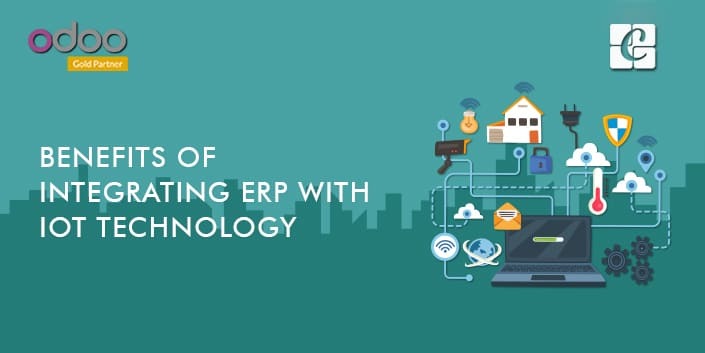 Today you have the option of Integrating ERP with IoT Technology for fueling more growth, showcasing more effective and standard operations and ruling out challenges in one go. Therefore a manufacturer needs to go for a pragmatic decision in adopting IoT. It's basic for a manufacturer to start an IoT pilot to accomplish real-time checking into key regions of production processes. As the pilot advances, IT groups consider different choices for incorporating IoT sensor-based information, applications and stages into the current IT foundation including their ERP frameworks. Luckily, many of the IoT application and related frameworks are giving broad Application Program Interface (API) and Web Service support, making the ERP-IoT integration quicker and progressively moderate. Because of APIs and Web Administrations, the times of making hand-coded connectors and connectors to help new innovations are ruled out. Odoo is disrupting the ERP community by hopping into the Internet of Things innovation. The new Odoo IoT module transforms the product into an out-of-the-case arrangement with IoT box. Moreover, the IoT box intends to associate gadgets to core ERP platform and broaden the span of ERP framework to an even more extensive audience and with expanding abilities. With this advancement, Odoo is ready to quicken its market obtaining of medium size endeavors and furthermore enabling the smaller organizations to get on board. To know more on Odoo IoT Box integration, kindly refer our blog Odoo IoT box integration.